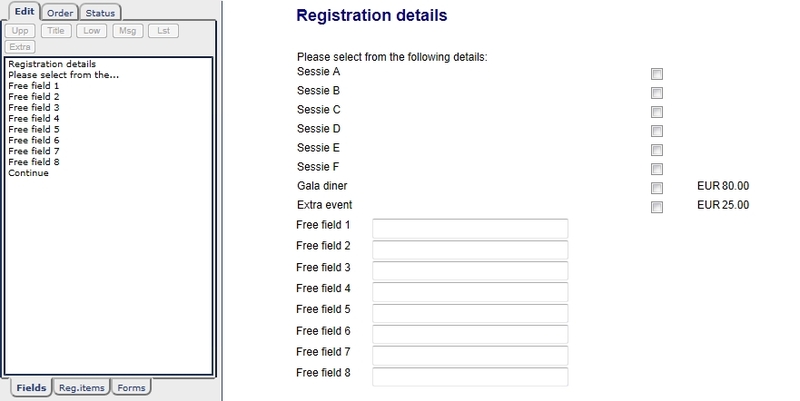 If you want to make changes or add text add the r-events, please click on ‘Forms' and select ‘Registration details’, the screen in which you can configure the events appears. This screen is called ‘Registration details'. The events are listed in the numerical order of the event code. 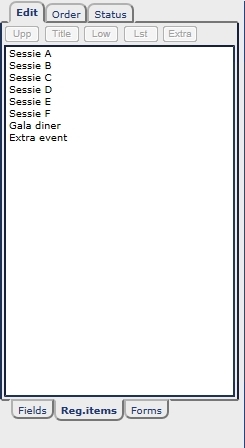 When you change or add events the sequence of the events codes determines the order in which they are listed. Using 'Upp', 'Title' and 'Low' you can configure the text above the item, the title of the item and the text below the item. By 'Items settings' you have the option to choose for: general settings, categories settings, extra settings. For more information about the settings click here.